Popsugar. Mackenzie on Rob and Kristen as parents. "I think they're both really good parents...or will be." OTRC - Kristen talks about how much the Saga ending means to her, "one of the most bittersweet experiences." Kristen on her fans "we share something...Its just cool that we're doing this together." OTRC - Rob talks BD2, mentions the battle scene "It's different." And moving on after Twilight's success, "I'm trying to do the best I can and hopefully they'll get financed because of the great Twilight fans." Rob's MTV Interview. Rob reflects on his Twilight journey, what he loves about CC "It's one of like the big premieres, you can have interaction with them(fans) in premieres there's only screaming...its a high intensity show. First impression... "I was incredibly insecure in the beginning...I've never done an American movie before...and everyone was more experienced than me, pretty much..."
And talks about playing a 'relaxed and adult Edward', "Its a strange experience suddenly making that transition to being...and playing fathers of 11-year-olds suddenly when you're playing a 17-year-old for five years." Movie Bytes Interview. Starts at 1:45. Rob talks Edward as main character, 'Prince Charming' "Are we talking about the same movie?" lol. Kristen on VampBella "She is best vampire, because she has like super self-control..."
Kristen talks Bella as a "well-rounded vampire" Rob talks about the different BD2 ending compared to the book. Showbiz411 - Rob talks Edward being a dad. 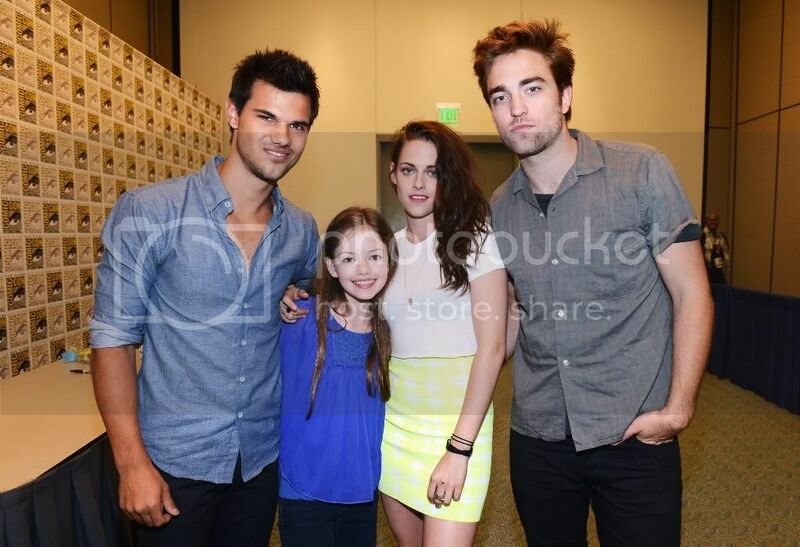 "I really didn't do many dad stuff because, Mackenzie is like 11y/o in 20 minutes..."
Showbiz411 - Rob, Kristen, and Taylor. MaximoTV/Hollywire. Kristen talks about being excited about ComicCon, and sharing stuffs with fans (clips). Rob its still unbelievable, the fact that there are still 6,000 people outside...there is absolutely no change at all...It's amazing." Screenslam: Mackenzie Interview. On what she learned from Kristen "I learned the most from watching her." "Rob did a lot of cool things." Princess Leia poll..."I like classic Leia to be honest, gold bikini Leia is obvious.